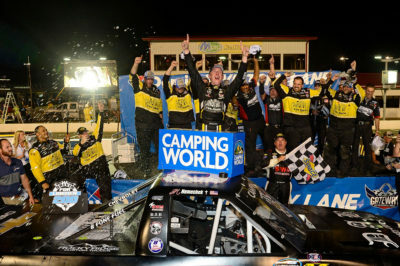 John Hunter Nemechek, driver of the #8 Chevrolet Silverado, celebrates with his team after winning the NASCAR Camping World Trucks Series Drivin’ for Linemen 200 at Gateway Motorsports Park on June 17, 2017 in Madison, Illinois. Truck 8 John H. Nemechek Chevrolet won the 4th Annual Drivin’ for Linemen 200, his 4th win in 61 NASCAR Camping World Truck Series races. This is his 1st win & 3rd Top 10 finish in 2017 & this is his 4st win & 3rd Top 10 finish in 4 races at Gateway Motorsports Park. Nemechek becomes the second youngest NCWTS driver to win at Gateway at the age of 20 years 0 months 6 days. The average age of the NCWTS winners at Gateway over the last four seasons is 19.5 – 2014 Darrell Wallace Jr. (20 years old), 2015 Cole Custer (17), 2016 Christopher Bell (21) and 2017 John Hunter. 2nd Place Truck 29 Chase Briscoe Brad Keselowski’s Checkered Flag Foundation Ford, started from pole posted his 1st Top 10 finish in at Gateway Motorsports Park. It is his 4th Top 10 finish in 2017 & was the highest finishing rookie. 3rd Place Truck 21 Johnny Sauter Allegiant Airlines Chevrolet, started from 9th place posted his 6th Top 10 finish in 6 races at Gateway Motorsports Park. 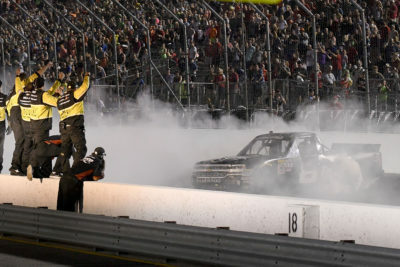 John Hunter Nemechek, driver of the #8 Chevrolet Silverado, celebrates with a burnout after winning the NASCAR Camping World Trucks Series Drivin’ for Linemen 200 at Gateway Motorsports Park on June 17, 2017 in Madison, Illinois. 4th Place Truck 88 Matt Crafton FVP/Menards Toyota, started from 6th place followed by 5th place Truck 98 Grant Enfinger # Ride TV Toyota, started from 14th place. 6th Place Truck 4 Christopher Bell JBL Toyota, started from 3rd place followed by 7th place Truck 16 Ryan Truex Dierberg’s/Bar Harbor Foods Toyota, started from 11th place. 8th Place Truck 27 Ben Rhodes Safelite Auto Glass Toyota, started from 12th place 9th place Truck 18 Noah Gragson # Switch Toyota, started from 7th place. Lastly in the Top 10 was Truck 24 Justin Haley # Kingman Chevrolet Chevrolet, in 10th place, started from 8th place. Johnny Sauter leads the point standings by 38 points over Christopher Bell. 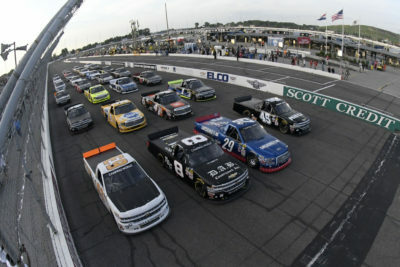 Chase Briscoe, driver of the #29 Brad Keselowski’s Checkered Flag Foundation Ford F150 and John Hunter Nemechek, driver of the #8 Chevrolet Silverado, lead the field past the green flag to start the NASCAR Camping World Trucks Series Drivin’ for Linemen 200 at Gateway Motorsports Park on June 17, 2017 in Madison, Illinois. The race had 3 Cautions for 17 Laps: 1st Caution on lap 37 for Stage 1 Conclusion. 2nd Caution on lap 72 for Stage 2 Conclusion. 3rd Caution on lap 149 for Truck 50 Josh Reaume Chevrolet Stopped On Track. Kyle Donahue, the driver of the #63 Chevrolet Silverado, John Hunter Nemechek, the driver of the #8 Chevrolet Silverado, Chase Briscoe, the driver of the #29 Brad Keselowski’s Checkered Flag Foundation Ford F150 and T J Bell, the driver of the #45 Black Riffle Coffee Co Chevrolet Silverado, lead the pack in a four wide military salute on a pace lap prior to the start of the NASCAR Camping World Trucks Series Drivin’ for Linemen 200 at Gateway Motorsports Park on June 17, 2017 in Madison, Illinois. 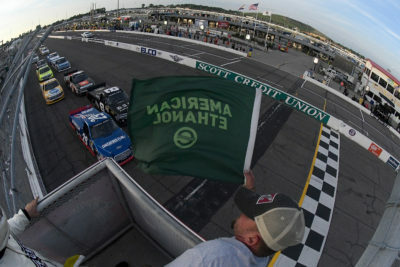 The race had 9 Lead Changes among 5 drivers: Lap Leaders: C. Briscoe # 0; John H. Nemechek 1-39; C. Briscoe # 40-73; C. Bell 74-80; C. Briscoe # 81-134; J. Haley # 135-137; M. Crafton 138-152; John H. Nemechek 153; M. Crafton 154; John H. Nemechek 155-160. Leaders Summary (Driver, Times Lead, Laps Led): C. Briscoe # 2 times for 88 laps; John H. Nemechek 3 times for 46 laps; M. Crafton 2 times for 16 laps; C. Bell 1 time for 7 laps; J. Haley # 1 time for 3 laps. 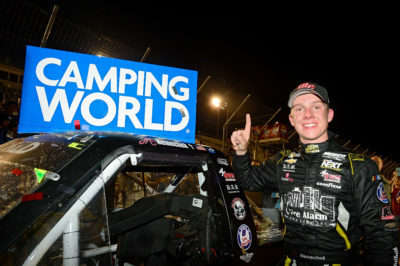 John Hunter Nemechek, driver of the #8 Chevrolet Silverado, places the winner’s decal on the truck in Victory Lane after winning the NASCAR Camping World Trucks Series Drivin’ for Linemen 200 at Gateway Motorsports Park on June 17, 2017 in Madison, Illinois. Race Comments: Prior to the start of the race, the following trucks dropped to the rear of the field for the reasons indicated: Nos. 18 and 63 (unapproved adjustments). Failed to Qualify: N/A. Caution Flags: 3 for 17 laps. Lead Changes: 9 among 5. Duralast GT Brakes ?Brake in the Race Award? 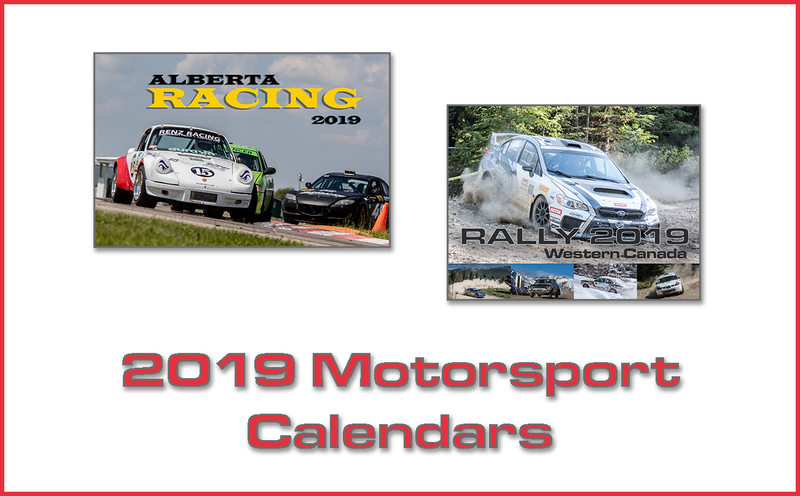 – Stage 1 : Chase Briscoe, #29 Stage 1 Duralast GT Brakes ?Brake in the Race Award? – Stage 2: Chase Briscoe, #29 Stage 2. Keystone Light Pole Award: Chase Briscoe, #29 136.828 mph. Mahle Clevite Engine Builder of the Race: Roush Yates Engines, #29. Mobil 1 Driver of the Race: Johnny Sauter, #21. Sunoco Rookie of the Race: Chase Briscoe, #29.